Pittsburgh, PA –Jan. 13, 2015 – Wombat Security Technologies (Wombat) and the Aberdeen Group (Aberdeen) have joined forces to develop and release new industry research titled, “The Last Mile in IT Security: Changing User Behavior.” This new study will help organizations quantify risks related to cyber security attacks and the dramatic reduction in risk they can realize by implementing security education. Based on the fact-based Monte Carlo analysis, this study shows that changing employee behavioral responses to cyber threats such as social media, phishing and other popular attack vectors can reduce an organization’s risk by as much as 70%. Following a year of unprecedented cyber security breaches during which criminals often preyed upon the security naivety of employees, the new analysis by Aberdeen and Wombat clearly demonstrates the return for companies that invest in implementing an effective security awareness and training program. While many companies have adopted an array of IT security technologies in an effort to reduce network, system, application and data security risks, less attention has been paid to perhaps the greatest evolving security threat: the end user. In spite of all of the technical controls deployed to prevent a breach, the root cause for many — if not most — reported security incidents are the errant actions of company employees. 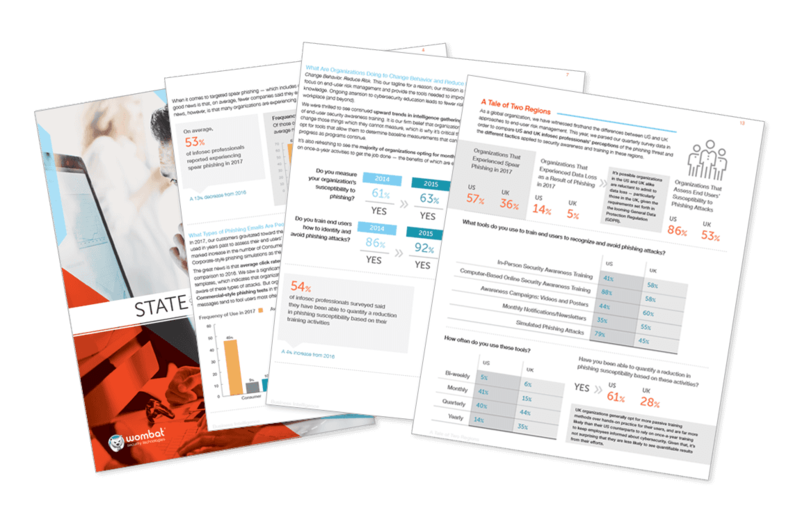 The new Wombat and Aberdeen research clearly demonstrates that investments in security awareness training can help businesses close this critical security gap. Wombat has deep roots in the security awareness and training market and is a recognized authority, having recently been named a leader in the Gartner Magic Quadrant for Security Awareness Computer Based Training, the Gold winner of the 2014 Global Excellence Awards in Tomorrow’s Technology Today for its Security Training Platform, and Bronze winner in the New Product category for its CyberStrength® knowledge assessment product. To learn more about Wombat’s Security Education solutions, visit www.wombatsecurity.com.